I opened up my cabinet the other day and saw two very similar cereals. My cereal, the Cascadian Farm Organic Cinnamon Crunch, and another person living in the house’s cereal, General Mills Cinnamon Toast Crunch. Hmmm. I wonder which one tastes and I would like better? I thought. Suddenly, I took out both boxes and put them to the test! For Cascadian Farm, I liked that it was lower in calories, lower in fat, higher in fiber, lower in sodium, and lower in sugar. For General Mills, what the picture cut off was that it had 10% daily calcium needs, which I liked, as Cascadian Farmprovided 0% for Calcium. And obviously for ingredients, I liked that each had “whole grain wheat” as the first ingredient, but Cascadian Farm had organic ingredients and General Mills did not. Now for the taste. 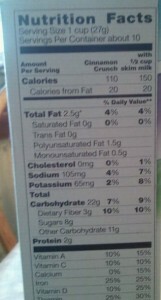 Here’s how the cereal looked. 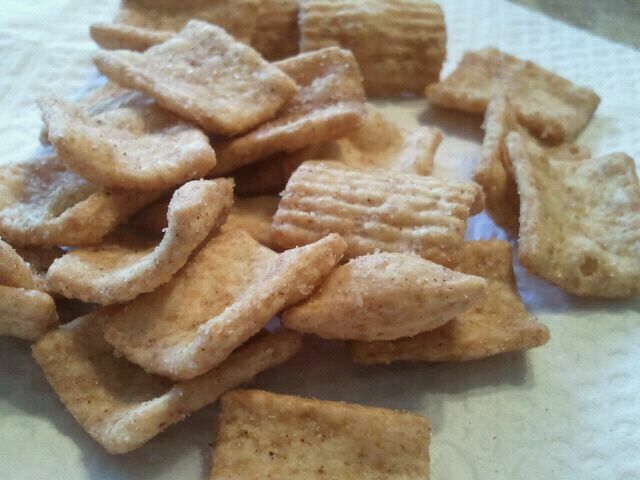 Cascadian Farm Cinnamon Crunch was smaller, sweet and crunchy, with a noticeable cinnamon flavor. It had a toasted wheat flavor as well, and a good amount of topping. Some of the squares lacked cinnamon, but not too bad. 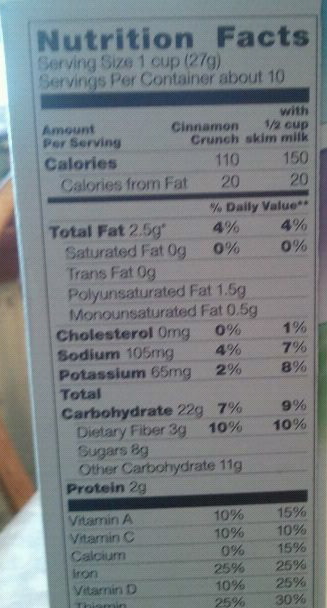 Overall, a very tasty cereal. General Mills Cinnamon Toast Crunch had more visible sugar on the squares, and was sweeter. 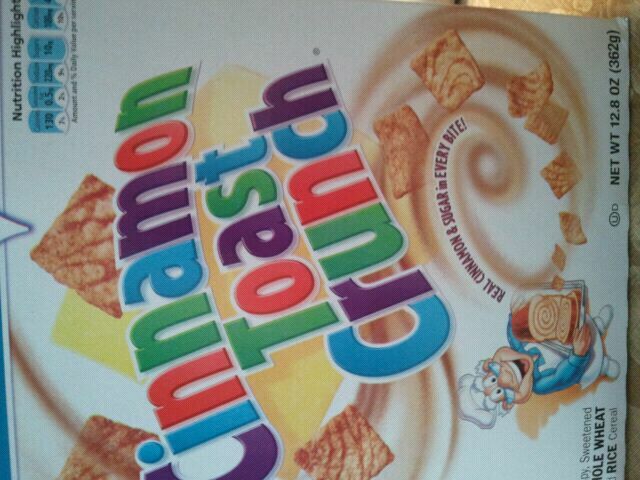 However, I felt they were lacking in the cinnamon aspect, and were more sweet than “cinnamon-y”. 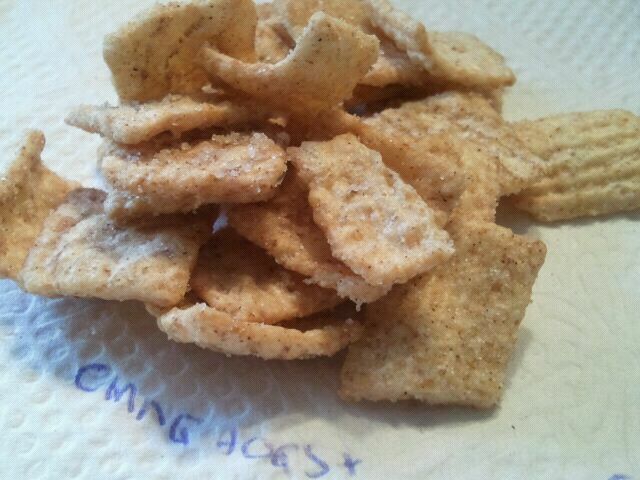 They felt crunchier and more sugary tasting than Cinnamon Crunch cereal, and not as dense. 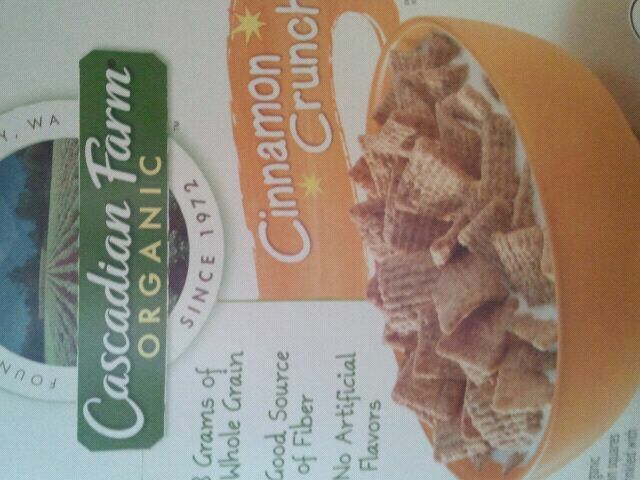 In a blind taste taste, I liked Cascadian Farm Cinnamon Crunch the best. I thought it had less of an “airy” texture, and better cinnamon flavor. 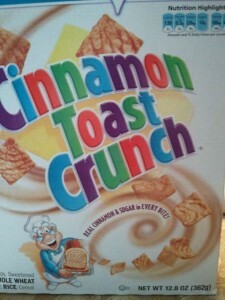 Cascadian Farm Cinnamon Crunch was the winner for me, I would give it 4 stars, and give General Mills Cinnamon Toast Crunch 3 1/2 stars. Have you had both of these cereals? Which do you prefer? i do like the side by side reviews – helps to put things in perspective! i haven’t tried either of these cereals though. i’m not a huge cold cereal fan – i’ll sprinkle the puffed grain cereals on yogurt bowls sometimes but the cereal by itself never fills me up. yes, totally! 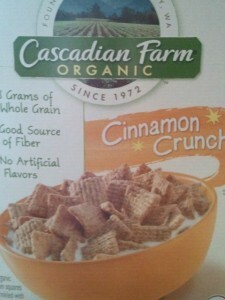 Cinnamon Toast Crunch is certainly tasty and sweeter, but I loved the stronger cinnamon flavor of Cascadian Farm! the cascadian farms actually LOOKS better! I’m pretty sure I heard on a Jillian Michael’s podcast that General mills make cascadian farm brand. So they can introduced healthier alternatives into the product line. I could be wrong but might be worth looking into.